HONOLULU – Hawaiian Airlines today celebrated the launch of its non-stop service between Haneda and Kona International Airports, bringing flights from Japan back to the Island of Hawai‘i for the first time since 2010. Hawaiian, Hawai‘i’s flagship carrier, invited more than 100 supporters of its application for the new service to welcome HA Flight 852, which landed in Kona shortly after noon. The crowd, including Gov. David Ige, U.S. Sen. Mazie Hirono and Hawai’i Island Mayor Harry Kim, gathered for a light lunch outside of the newly established federal inspection facility (FIS) at Kona airport just prior to the flight’s arrival. Hawaiian’s triweekly service between Haneda in Tokyo and Kona is the latest route in the airline’s fast-growing international network and adds to its robust presence in Japan. 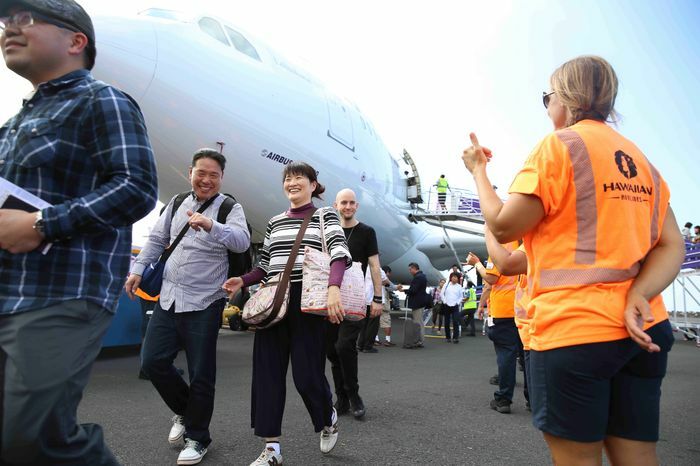 It follows the launch in July of daily service between Narita and Honolulu, and further complements Hawaiian’s flights from Haneda, Osaka and Sapporo to Honolulu. Prior to departing Haneda, guests aboard today’s inaugural flight were treated to a special gate-side ceremony featuring Hawaiian music and hula, refreshments, a traditional Hawaiian blessing and the giving of fresh flower lei. Please click here to watch a video of the day's festivities in Kona. The arrival of HA852 culminates a months-long process to return flights from Japan to Kona. In April, Hawaiian applied to the U.S. Department of Transportation (DOT) to offer three times weekly service between Haneda and Kona, along with a second frequency four times weekly between Honolulu International Airport and Haneda. Hawaiian made the case that flights between Hawai‘i and Japan are the most traveled and most beneficial to the U.S. economy, and noted the Haneda-Kona service would open up Hawai‘i’s largest unserved international market. The U.S. DOT granted Hawaiian’s request in May, and earlier this month the U.S. Customs and Border Protection announced the re-establishment of a FIS at Kona airport to process guests arriving on Hawaiian’s flights. Hawaiian will operate its new Haneda-Kona and Haneda-Honolulu services with wide-body Airbus A330-200 aircraft. The fleet is currently being retrofitted to include 18 lie-flat seats in the Premium Cabin, 68 Extra Comfort seats and 192 seats in the main cabin. From the moment guests arrive, they will enjoy Hawaiian's signature Mea Ho'okipa (translation: I am host) onboard service, long-celebrated for its warm and friendly celebration of the culture, people, and Aloha Spirit of the Hawaiian Islands. Hawaiian, Hawai'i's largest and longest serving carrier, was among the first three U.S. airlines granted authority to operate at Tokyo's Haneda airport in 2010. For the last six years Hawaiian has transported over half a million passengers out of Haneda – more travelers than any other U.S. carrier – and 2.2 million passengers between Japan and Hawaii. Its service to Honolulu alone has added at least $941 million to the U.S. gross domestic product, generated $564 million in direct spending and led to the creation of 2,337 new jobs. It is estimated the new triweekly Haneda-Kona service will spur $56 million in annual visitor spending. Hawaiian has also hired 34 employees in Kona associated with the new flight operation. In commemoration of the new route, Hawaiian is inviting Japanese travelers to learn about the Island of Hawai‘i by visiting www.Facebook.com/HawaiianAirlinesJapan and entering a drawing for a chance to win two roundtrip tickets for two between Haneda and Kona. The promotion ends Jan. 18. More information about the new Haneda-Kona flight is available at Hawaiian’s Japanese-language website www.HawaiianAirlines.co.jp, or by contacting the airline’s Tokyo office at 0570-018-011 or preferred accredited travel agency. In the U.S., information can be found at www.HawaiianAirlines.com, or by calling Hawaiian’s reservations center toll-free at 1-800-367-5320.